Another business may get caught between in-process plans to do business on Miami Beach and an ordinance to prohibit businesses like them from locating in certain places. Walgreens wants to locate a large two-story retail outlet in a renovated building at 947 Lincoln Road but an ordinance approved by the City Commission on first reading this month would effectively shut the door on those plans if Walgreens is not grandfathered in. Last month, MedMen, a medical marijuana dispensary found itself caught between its plans to located on Lincoln Road and a new law requiring distance separation between dispensaries. The Commission did not grandfather MedMen in and, this week, the company sued the City of Miami Beach. 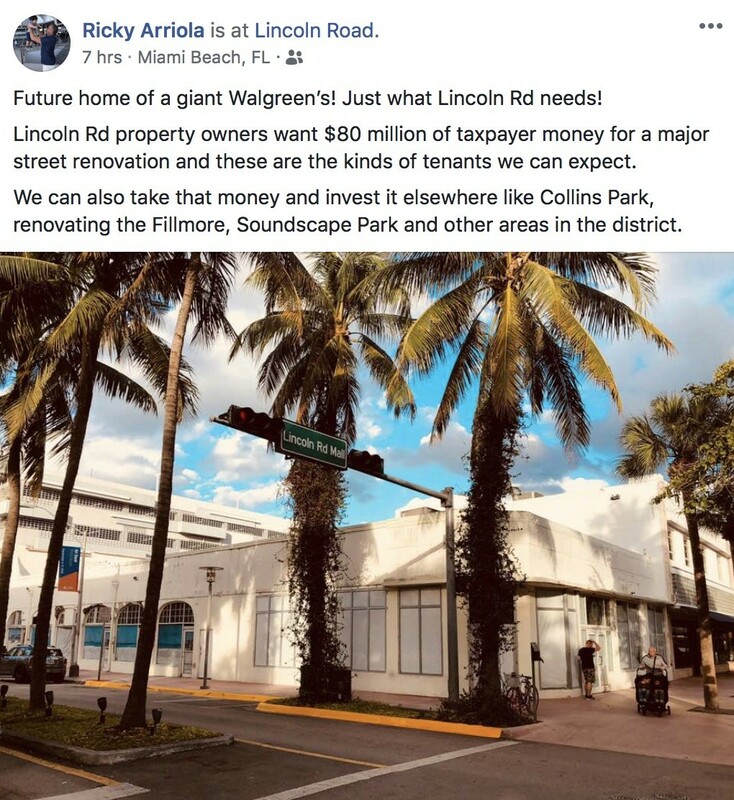 After hearing that Walgreens was planning on opening up on Lincoln Road, Commissioner Ricky Arriola who has championed the prohibition of formula retail and restaurants on the City’s more iconic streets – Ocean Drive, Ocean Terrace, and Lincoln Road – sponsored an ordinance to change the definition of convenience stores. He expressed his displeasure in a Facebook post on January 11. In the case of 947 Lincoln Road, City Planning Director Tom Mooney told City Commissioners at their meeting this month the City was not aware the use would be as a convenience store. McDowell said, however, “We don’t believe it does affect the project.” Based on equitable estoppel law, when a project is already in the application phase, changes in the law that would make that project non-conforming “shall not be enforced against the application of a project,” he said. He said nearly $2 million has been spent to date on the project. “Tom’s reason,” he said referring to Mooney was “’You didn’t tell us you were going to be a convenience store. I’m here to tell you, as of today, we’re not a convenience store. We are almost 14,000 square feet on two floors,” he said referring to the current definition of convenience store being less than 6,000 square feet. “It did not disclose the use as a convenience store,” City Attorney Raul Aguila said. The HPB gives general approval for buildings and how retail furnishings are viewed from the outside but does not approve specific uses or tenants, Mooney said. “Tom [Mooney] is, in my opinion, correct, and before I sponsored this legislation, I talked to him and to our City Attorney, ‘Can we do this legally’ and the answer was ‘Yes’,” Arriola said. Regarding the $2 million spent on the building, he said the owner can recoup that with another tenant. The ordinance passed unanimously on first reading but several Commissioners asked for further discussion of the applicability to Walgreens on second reading in April. Postscript: The fact that the tenant was Walgreens was known to the City last summer. In his statements to the Commissioners, Mooney did not say the City was not aware the tenant was Walgreens. He used the term “convenience store” when saying the City was not aware that would be the use. According to the City’s Finance Department, a check for $25,613.60 for permitting fees was paid on August 10, 2018. The check was from the Walgreens Family of Companies. Asked if the date of the check changed his mind regarding applicability to Walgreens, he said, “We’re told by our legal team that our actions are proper and legal so it doesn’t change my mind.” We did not have a copy of the building permit when we talked to Arriola. Second reading will be at the April 10 Commission meeting.